ROSWELL - The TRUTH will NEVER be known. Conduct all the investigations one might like so many years after the event and without eye witness accounts and discovery of old documents there is no truth. The time surrounding and following the Roswell "crash(es)" were times of high altitude parachute tests, Viking-Mariner rocket tests, classified "weather balloons" tests and a lot more. The reported timelines of these events have never been made to match the timeframe of this (these) crash(es). Documents and recording media can be damaged or altered. Material is packaged and laid away for future study...it gets transported and sometimes goes missing or forgotten. The U.S. Military at the time and the civilians working within it all knew, understood, and mostly respected the meaning of National Security and that "loose lips sink ships". An event such as a crashed alien craft would have had a small recovery team and a very secured environment of trusted individuals. Black and white 8mm movie film and movie industry film existed at that time as well as magnetic tape. Most documentation would be paper documentation. So is the Raiders of the Lost Ark storage facility a fantasy? Don't bet on it. This area is a test area for the U.S. Air Force at the highest levels of security clearances. Anyone having been associated to places such as this and the programs within sign a non-disclosure agreements and are given special idocs. Violating these agreements and idocs result in permanently stripping of all clearances, being prohibited from all future Department of Defense and Federal employment and sometimes a vacation to a Federal (or military) prison not of their choice. One of my cousins took her mother out to Las Vegas a few years ago. They took a side trip on the extraterrestrial highway to the outermost perimeter and took this photo. 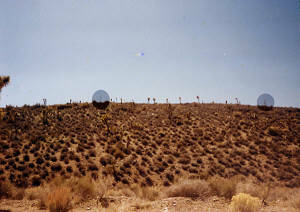 The two objects in the shaded circle are electronic surveillence towers. She captured something else in this photo. If you are ever close enough to see a sign with this wording turn around and leave...quickly. If you choose to go beyond the sign you are now a target and you will not be permitted to get much further.